It took 20 years book Disney is finally trying to make good on a prediction. In 1990 Disney released 8 new comic book titles including Duck Tales, Goofy Adventures, and Roger Rabbit. Disney Comics released these new monthly series with the slogan, "This could be the start of something big!" While this moment in time for Disney based comics may have been the start of producing a large amount of titles, it wasn't until the very end of 2009 that Disney made it "big" by purchasing Marvel Comics for $4 billion. I randomly found this old advertising tag in the comic of the day, Disney Comic's Roger Rabbit #1 (one of those comic books you have no idea how you came to own it). Roger Rabbit #1 takes place after the events in the successful 1988 Disney movie, "Who Framed Roger Rabbit." The issue has two short stories. The first is a quick case of "who done it" which introduces a new detective, Rick Flint, into the Roger Rabbit world. The second short story is a slapstick piece about Roger Rabbit meeting his new Weasel neighbor. 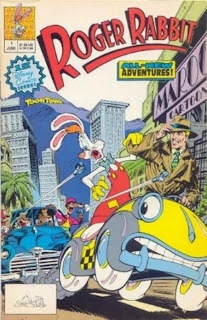 The comic is not written poorly, but it is just a throw away book that was designed to target younger children who enjoyed "Who Framed Roger Rabbit." The medium of comics was not pushed. The character and story of Roger Rabbit is quite interesting though. The movie is based on the 1981 mystery novel by Gar K. Wolf titled, Who Censored Roger Rabbit? In the novel we meet some of the same characters such as the detective Eddie Valiant, Roger's wife Jessica Rabbit, and the baby...Baby Herman. One major difference between the book and movie is that Roger Rabbit is killed. Disney lightened that plot point up a bit. Appearantly killing cartoon Rabbits is frowned upon. Someone better tell Yosemite Sam and Elmer Fudd.